Twitter wants to take its love for Star Wars to a whole new level. Looking forward for the release of Star Wars: The Force Awakens, they decided to give their users a little treat. They have introduced some crazy Star Wars emoji. Attention Star Wars fans everywhere: Starting today, Twitter users will have even more ways to express their passion about their favorite pop culture phenomenon with new Twitter-exclusive #StarWarsEmojis. In anticipation of the theatrical release of “Star Wars: The Force Awakens,” we partnered with Disney and Lucasfilm to create custom Twitter emojis, giving Twitter users the ability to show their enthusiasm for the ever-evolving Star Wars universe. Tweeting a #StarWarsEmoji is simple. 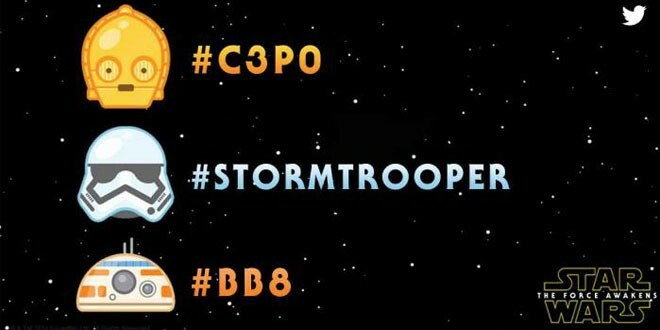 Twitter users who post hashtags representing keywords associated with specific Star Wars characters and legacy themes will see a small emoji-like icon automatically appended to the end of the text of the tag, embedded within the Tweet. Be sure to follow @StarWars to get news and updates for #TheForceAwakens. Fire away your tweets after days of no tweets just for the fun of Star Wars! Dark Matter Detected for First Time? Planet Found Orbiting 2 Suns! Strange Radio Message From Space - Scientists Baffled! Previous: Batman V Superman First Teaser Video – Whats on April 20? Next: No Apple Watches in Stores Till June?! ?